And now, my son, I have somewhat to say concerning the restoration of which has been spoken; for behold, some have wrested the scriptures, and have gone far astray because of this thing. In order to help Corianton understand the fairness and justice inherent in the doctrine of the resurrection, Alma expounded upon what he called “the plan of restoration” (Alma 41:2). The usage of this term marks a notable shift from the previous chapter, wherein Alma almost exclusively referred to this doctrine as the “resurrection.” The transition in terminology seems to signal that a more nuanced and developed explanation was underway. An ancient legal principle known as talionic justice embodies this sentiment. John W. Welch explained, “Talionic justice achieved a sense of poetic justice, rectification of imbalance, relatedness between the nature of the wrong and the fashioning of the remedy, and appropriateness in determining the measure or degree of punishment.” Essentially, this was the famous law of an “eye for an eye” and a “tooth for a tooth” which was divinely revealed in the Old Testament and applied broadly throughout the ancient Near East (Exodus 21:24). And he that killeth a beast shall make it good, beast for beast. so shall it be done to him. And he that killeth a beast, he shall restore it. And he that killeth a man, he shall be put to death. “The twist here is clever: After listing four pairs of terms, Alma pairs two lists of four terms and reverses their order at the same time.” Notably, this chiasm focuses mostly on the positive aspects of restoration. It is true that evil, carnal, and devilish behavior will in some way return to afflict the sinner, but in this instance Alma chose instead to emphasize the blessings of goodness, righteousness, justice, and mercy that will be restored to the righteous. Although he was very explicit and emphatic in his denunciation of sin, Alma ultimately wanted Corianton to “let the justice of God, and his mercy, and his long-suffering have full sway in [his] heart” (Alma 42:30). Some readers may view the legal statutes of the Old Testament as irrelevant or obsolete, but Alma’s exhortation demonstrates that their fundamental principles are eternally relevant. Clearly, a divine implementation of talionic justice will be the guiding principle of restoration as it relates to final judgment and the resurrection. For example, people will receive forgiveness as they have forgiven (Matthew. 6:12); and people will be judged by the way they have judged others (Matthew. 7:1). Awareness of this principle can deepen appreciation for how, even though the application of truth may vary, “God is the same yesterday, today, and forever” (Mormon 9:9). Alma’s use of chiasmus to illustrate this principle is also instructive. What better way to demonstrate the inverse principles of divine justice than by using an inverse form of poetic parallelism? As Welch explained, “an elaborate and elegant chiastic structure embodies the very notion of the talion.” Therefore, both the form and the content of Alma’s sermon converge upon a singular, overarching principle of divine justice: “that all things should be restored to their proper order” (Alma 41:2). Such a profound and elegant truth must have stood in stark contrast to the unbalanced and incoherent program of salvation promoted by Nehor. John W. Welch, The Legal Cases in the Book of Mormon (Provo, UT: BYU Press and Neal A. Maxwell Institute for Religious Scholarship, 2008), 335–381. Donald W. Parry, ed., Poetic Parallelisms in the Book of Mormon: The Complete Text Reformatted (Provo, UT: Neal A. Maxwell Institute for Religious Scholarship, Brigham Young University, 2007). Richard O. Cowan, “A New Meaning of ‘Restoration’: The Book of Mormon on Life After Death,” in The Book of Mormon: Alma, The Testimony of the Word, ed. Monte S. Nyman and Charles D. Tate, Jr. (Provo, UT: Religious Studies Center, Brigham Young University, 1992), 195–210. For more information concerning the doctrine of resurrection in the Book of Mormon, see Book of Mormon Central, “Why Was Corianton So Concerned About the Resurrection (Alma 40:9),” KnoWhy 148 (July 21, 2016). At the end of chapter 40, Alma began to describe the resurrection as the “restoration of those things of which has been spoken by the mouths of the prophets” (v. 22, emphasis added). This shift carried over into Alma 41, where Alma mentioned “restoration” or “restored” seventeen times, while only mentioning “resurrection” once. 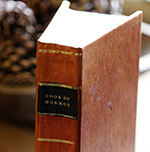 To see how frequently Alma mentioned the resurrection in relation to other Book of Mormon authors, see John Hilton III and Jana Johnson, “Who Uses the Word Resurrection in the Book of Mormon and How Is It Used?” Journal of the Book of Mormon and Other Restoration Scripture 21, no. 2 (2012): 32–33. See Book of Mormon Central, “Why Did Nehor Suffer an ‘Ignominious’ Death? (Alma 1:15),” KnoWhy 33 (May 26, 2016). John W. Welch, The Legal Cases in the Book of Mormon (Provo, UT: BYU Press and Neal A. Maxwell Institute for Religious Scholarship, 2008), 338–339. For a general explanation of chiastic parallels, see Donald W. Parry, ed., Poetic Parallelisms in the Book of Mormon: The Complete Text Reformatted (Provo, UT: Neal A. Maxwell Institute for Religious Scholarship, Brigham Young University, 2007), xvi–xix; John W. Welch, “Chiasmus in the Book of Mormon,” in Book of Mormon Authorship: New Light on Ancient Origins, ed. Noel B. Reynolds (Provo, UT: Religious Studies Center, Brigham Young University, 1982), 34–39; John W. Welch, “Criteria for Identifying and Evaluating the Presence of Chiasmus,” Journal of Book of Mormon Studies 4, no. 2 (1995): 1–14. Formatting follows Welch, Legal Cases, 343. Welch, “Chiasmus in the Book of Mormon,”33–52.